The average age of cars on the road is 11 years old, and many of the lifesaving safety features have only come out in recent years. In fact, Consumer Reports recently ranked the top “must-have” safety features on a new vehicle, and a majority of these features is available in the aftermarket. 12Volt retailers should highlight these safety features in their shops for drivers of older model vehicles. The latter two features are available through the 12Volt aftermarket. Many brands offer these products, and the costs range to fit most budgets. The report goes on to list must-have and nice-to-have convenience features as well, and many of those are also available through 12Volt retailers. Two of the major ones mentioned were Android Auto and Apple CarPlay, which encourages drivers to put their phones down when operating their vehicles. Speak to your customers about the value and overall user-friendly experience of these features. We recently contributed to Vision Zero Automotive Network, which strives to eliminate all traffic fatalities and severe injuries through the 12Volt aftermarket. We believe creating safer roads with these aftermarket safety features is an important mission to stand behind as a 12Volt distributor, especially with so many reports emphasizing the benefits of these features. Are you and your shop educating customers on these safety features? You can increase their on-road safety by keeping their car up-to-date with today’s safety standards. You have your Facebook business page set up with your business information, logos, and branding, and now you’re stuck: what do you post? What posts are best for this platform? When should I post? Some of this will take some trial and error as you figure out the needs of your audience, but the number one thing to keep in mind is that social media is about building rapport with your customers. Don’t push products and prices too much – push relevant content that your customers are looking for, and do it consistently. Why use Facebook? It’s the largest social network with over 2 billion users, and it’s free to have a business page. This is the best way to get in front of current and potential customers. Also, advertising on the platform is affordable and effective when done correctly. *Bonus: Do you have a blog for your website? A blog allows you to post new, relevant content regularly without bogging down the main navigation of your website. Post lengthier content (500+ words) and link to it in these posts. *Bonus: This is also content you could write on a blog – although posting from other sources is fine, providing this content on your own website builds credibility with both Google and your customers. It helps you become the trusted source for information. (Don’t copy/paste content from other sources onto your blog or website – this actually has the opposite effect: it’ll cause Google to penalize you for duplicate content). In the left hand column, select “Posts” to view when your page followers are online. Hover over the graphs/elements to learn more about specific numbers. If you want to track your social media efforts on Google Analytics, look into using URL parameters to get accurate tracking data. Be genuine and conversational, yet professional – not stiff and corporate-y. Plan ahead for what you want to cover on your Facebook page – it’ll be easier to manage and won’t come off as though it’s a last minute afterthought. Don’t delete negative comments. Yes, you read that right. Don’t delete them. This is an opportunity for you to shine as a business. Negative comments are normal – it’s how you respond that makes a difference (and remember: if you message them privately, they CAN screenshot your messages and share it publicly. Always handle things professionally and appropriately). There are caveats to this, of course. Check out this resource to learn more. Be responsive. If someone comments or messages, react or reply to their comment/message. If they leave a review for your business, reply (whether the review is good or bad). If they share your post, comment on it and thank them for sharing. Doing this encourages people to engage with your social media accounts. Have signage up to encourage customers to follow your page. Mention it to customers in person. Include it in invoices and any email correspondence. Encourage them to interact with and review you. Do social media-specific deals and giveaways that can’t be found anywhere else. These create a value proposition for following your accounts, and it rewards your followers for being loyal to you. Check out the “A few notes to remember…” section at the bottom of our Social Media 101 blog for other pointers on social media best practices. Get more Facebook Marketing tips here. TAMPA, Fla. (March 29, 2019) – DOW Electronics, the leading Consumer Electronics distributor in the South, was awarded 2018 Distributor of the Year by Arc Audio. Chris Ribeiro, of Arc Audio, stopped by the DOW Electronics headquarters in Tampa to present the award. In addition, DOW Electronics is now the premier Arc Audio distributor across 11 southern states. To learn more about DOW Electronics, please visit www.DOWElectronics.com or call 1.800.627.2900. Headquartered in Tampa, Fla., DOW Electronics is one of the largest independently owned and operated electronics distributors servicing independent retailers in the Southern United States for 60 years. With six locations serving Alabama, Arkansas, Florida, Georgia, Kansas, Louisiana, Mississippi, Missouri, North Carolina, Oklahoma, South Carolina, Tennessee, Texas, Puerto Rico, and the US Virgin Islands, DOW Electronics focuses on providing consumer electronics that enhance the customer experience. Businesses incorporate a wide variety of set ups and plans for their phone systems. Many of the VoIP/UCAAS platforms offer a wide array of features that can benefit a customer in various ways. However, sometimes there are potential weak spots when it comes to VoIP. One of these, in particular, is a set up where a business has many phones that aren’t being used too often. Traditional phone systems allow a customer to purchase lines and share phones between those lines. Whereas with VoIP, typically a customer would pay for a full “user” and this user has capabilities for one person in particular. However, that isn’t always the case. VoIP/UCaaS providers have heard concerns from their customers and each has their own solution to help businesses. RingCentral, for example, has a “Limited Extension” option. This is basically a phone that would make, receive, and transfer calls. It would not be tied to a specific person and would not have features like voicemail etc. This extension is available for only $14.99 / month. Vonage has the option of sharing up to 3 desk phones per seat/user with full functionality. They also can share up to 8 mobile devices per seat! In addition, Vonage’s pricing for seats start at $19.99 / month. Star2Star is a hybrid solution that shares some of the features that were lost with traditional phone systems. This is due to a “Starbox” device that is installed on site and operates as a high quality operation and failover mechanism. One of the unique differentiators of Star2Star is the ability to purchase “lines” rather than seats or users. One can share phones between those lines, thus eliminating the need to pay a per phone cost. All of these solutions offer workable solutions for some tricky situations with business phone system set ups. DOW Electronics has Partner Programs available for all of these platforms where retailers can offer solutions for their clients. We discussed some of the questions you can answer with Google Analytics data in our Deep Diving into Google Analytics: Part 1 blog. In this 2nd part of the deep dive, we’ll look at how you can use this data to check if your digital marketing efforts are driving profit for your business. How do I know if my digital marketing efforts are driving profit for my business? Google Analytics allows you to set goals that represent a conversion on your website. Once this is set up, you can go to “Conversions” in the left navigation to see how your goals are performing. To set up goals, go to “Admin” in the left navigation. Under “View,” select “Goals” and click the red button that says “+NEW GOAL” at the top. There are many goal types to choose from – Google Analytics offers quite a few templates, but you can also create something completely custom. Some examples of goals that reflect profit would be “Place an order” or “Schedule service,” but there may be additional goals you’d like to track too (such as email/newsletter signups, filling out a contact us form, etc). Step 1: Select the correct goal template, “Place an order,” under the Revenue section. Step 2: Set up the goal description and type. For this example, we’re going to use “Destination” as the goal type because our website loads to a “thank you” page after someone submits an order. Step 3: Set up the details of the goal – this is the information Google Analytics needs in order to register your goal’s conversion. For this example, we entered the URL string that represents the “thank you” page. Once we completed the set up, we used the “Verify this Goal” feature right above the Save button to ensure the goal was set up correctly. I’m looking at the same data every month – is there an easier way to view it? As you’re becoming more familiar with the platform, you may realize there’s a lot you can do with this tool. To learn more about other ways to utilize Google Analytics to your advantage, we recommend Google’s Analytics Academy. Be on the lookout for our next blog explaining another important Google tool: Search Console. We’ll also delve into more social media-related content too! Google Analytics provides you quite a bit of data, but how do you use it to make informed decisions about your business? Let’s look at some of the questions you can answer with the data, in addition to other features you can enable with Google Analytics. Who are my customers? Who’s visiting my website, and how are they using it? A couple sections in Google Analytics are relevant to learning more about your audience. In the left navigation, you’ll see Audience, Acquisition, and Behavior. The Audience section will give details about the demographics and interests of your website users. The Acquisition section will tell you about how those website users made it onto your website. The Behavior section will tell you where your website users first landed on the website, which pages are most visited, and how they utilize the website. Use the Demographics section to determine how to target your audience. Tailor the content, advertising, and look of the website to your main users. For example, if your users are predominantly male, ages 18-34, you’ll want to have a modern looking website that’s easy to navigate. Offer multiple ways to contact your business (contact form on site, text, call, etc). You’ll also want to have an active social media presence. You can use the Interests section to tailor your content and advertisements. For example, if a majority of users is sports fans, incorporate major sporting events into your marketing campaigns. Offer a deal on TVs before major events. If your users love food, collaborate with a local favorite restaurant and offer a discount or coupons for that restaurant when they purchase from you. You can use geographical locations (in the Geo section) to inform your advertising decisions. If you’re planning to expand your business to other locations, this information can be beneficial as well. If you notice you’re not getting much traction in a particular area, you can add website content and ads to target those areas. Google Analytics also breaks up your users based on new visitors vs. returning visitors (in the Overview section). This information can help you determine if you need to do more to bring in new customers or implement strategies to maintain loyal, returning customers. Use the data about devices to influence your marketing strategies and website layout. All websites should be mobile friendly (Google gives priority to mobile-friendly websites), but if you notice a majority of your users are using mobile devices, you’ll want to add “Call Now” links in addition to structuring your page layouts to mobile users. Look at your own website from a mobile device to see if it’s easy to use. Use the Top Channels data (direct, organic, email, referral, etc) to determine which avenues of traffic you can improve. For example, if you aren’t getting much organic traffic, then you’re not showing up in searches for your products/services. Consider optimizing your website for search engines so you show up in search engine results pages (SERPs). If you regularly email your customers, but you don’t get traffic from it, test some alternative email designs, subjects, and content to improve it. Under the “Site Content” section, select “Landing Pages” to view pages your website users land on. You can narrow this data down even more by using the “Secondary dimension” drop down to show where the traffic on each page came from. In the dropdown menu, click the arrow next to Acquisition and select Source. This new column will show you where your traffic is coming from. You can click on a specific landing page to focus on the data for that one page. Under this same section, select “All Pages” to view your top visited pages. If you’re looking for the performance of a specific page, you can search for it in the search bar above the data table (to the right of the Secondary dimension drop down). Search by the URL or a specific word in the URL. Use this data to determine which pages you need to improve. Check your Site Speed too. Having a fast-loading website is critical to website performance and conversion rates. To give you an idea of a baseline, if your website loads in 2.9 seconds, it is faster than approximately 50% of the web. The faster your site speed, the better – customers are less likely to leave your website if they can find the information they need quickly. Are my website users using the search bar or navigating through the website to find info? 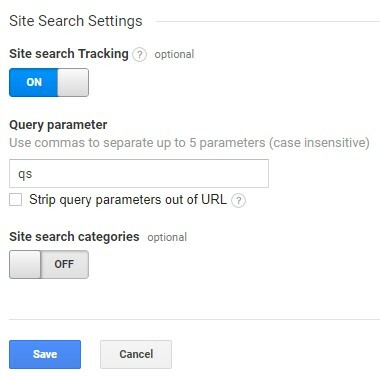 Google Analytics has a Site Search* feature (listed under Behavior) that tells you which terms your website users are searching on your website (*this is only relevant if you have a search bar on your website). This feature has to be set up separately – it requires you to give some additional info to track the search queries. To set this up, you’ll go into the Admin section (in the left navigation). Under “View,” you’ll select View Settings at the top. Under the section called “Site Search Settings,” turn on “Site search tracking”. You’ll need to include something called a “Query parameter” – when someone searches something on your website, the URL that shows up will have a series of letters that designate it as a search query (instead of a normal page on the website). These letters should appear before the “=” in the URL, but if you’re unsure, you can contact your web developer. For example, if someone goes onto our website and searches “red atom,” our URLs designate a site/query search with the letters “qs”. Therefore, our Query parameter is “qs”. Once this is set up, it will start tracking your searches from that point forward (it won’t pull back data). This data can give you an idea on whether your site search functionality is working well, and it can help inform your marketing strategy on top products/services your website users are looking for. How much of my website traffic is my own employees? Doesn’t this skew my data? You’ll want to filter out your internal IP addresses to prevent your own employees from skewing your data. Create a new filtered view to do this – you always want to keep a completely unfiltered view of raw data. To learn how to set up a new view, go to “Admin” in the left navigation and select the blue button that says “+Create View”. Select “Website” and choose a Reporting View Name that differentiates this new view from your unfiltered one (which could be as simple as “Filtered view,” or something more specific, like “Filtered IPs”). Set the Reporting Time Zone and click “Create View”. The top of your Google Analytics window should now say the new view. If it doesn’t, click the downward arrow and select this new view to begin setting up your filters. In the same area of the Admin panel, select “Filters” under the View section. Click the red button that says “+ADD FILTER”. Set the Filter Name to something like “Exclude Internal IPs” and select either option: “Predefined” or “Custom” under the Filter Type. We have ours set up as a custom filter because of how many IP addresses we need to filter out, although you can use a predefined filter. Choose “Exclude”. Under Filter Field, choose “IP Address” from the dropdown menu. 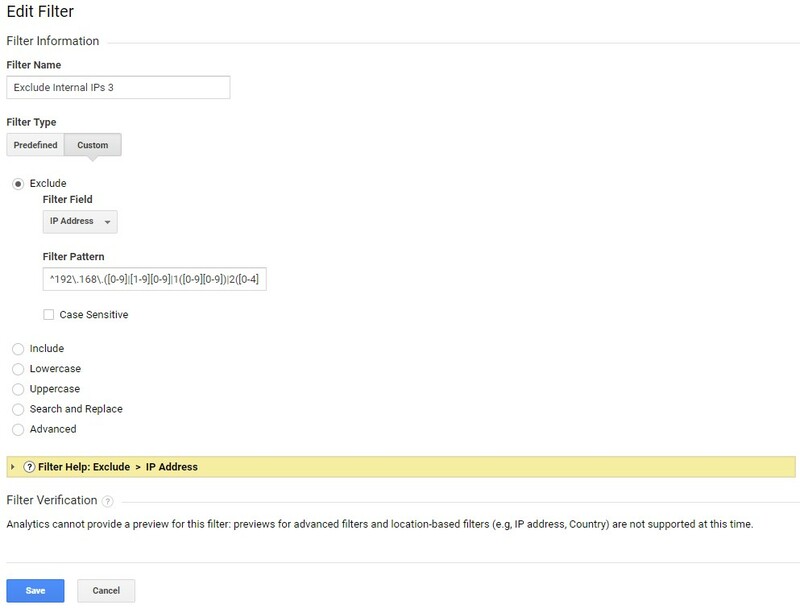 For the filter pattern, you can enter one IP address. If you want to list more than one, you have a couple options to do so. Check out this guide to learn the best option for filtering out your internal traffic from more than one IP address. Ready for more? Check out part 2 of our Deep Dive into Google Analytics! Your Home screen gives you a brief overview of how your website is performing. This is an easy way to track some of your most important metrics. The other sections of the left navigation offer you a view of additional details. Customization allows you to make custom dashboards and reports – once you determine the metrics you find most beneficial to your business, set up a dashboard and/or report customized to you. Real-Time gives you current data for active users on your website. Learn more about the uses of this feature, along with its limits and caveats, here. The Audience section is where you’ll find all the information about your website’s users. You can learn more about their interests and demographics too, which allows you to better strategize your marketing. The Acquisition section gives you data on how users got to your website. Find out which channels your traffic is coming from to know where you can improve. The Behavior section gives you data on how users behave on your website. This gives you an idea of how they move through the website, along with which content/pages perform the best. Conversions is a more advanced section of Google Analytics. You can set up goals to track how many of your users complete a particular action on your website (such as filling out a form or placing an order). To learn more about creating goals, click here. The Discover section is a learning space similar to the Analytics Academy. You can find a lot of information about the tool, in addition to learning more about other tools you can utilize to better your business (such as AdWords). The Admin section is where you’ll manage all your settings for your account, properties, and views. We’ll go over these in more detail below. *Note: Make sure to set the relevant date range in the upper right corner. You can also compare data to other time periods. Users: the number of people who have been on your website in the specified date range. Sessions: the period of time a user is actively engaged on your website in the specified date range. Pages / Session: the average number of pages viewed during a session in the specified date range. Session Duration: the average length of a session in the specified date range. Bounce Rate: the percentage of single-page sessions that a user did not interact with the page. A bounced session has a duration of 0 seconds. *Language: If you’re a retailer that works with customers that speak multiple languages, it may be beneficial to consider including other languages on your website if you haven’t already. Use the Language section of data to determine how many of your customers use English vs. another language. Top Channels: the breakdown of where your website traffic is coming from. You can get more details about these channels by going to All Traffic > Channels. Knowing where your traffic is coming from and how that traffic channel is performing can help you determine where you need to improve your strategy moving forward. Direct: these people have entered your website URL directly into their browser without clicking from any other source OR Google isn’t able to track the traffic channel (such as clicking a link in a Word doc, instant messenger application, or a mobile app). Organic: these people come from search engines, clicking on your website within the search results, not the ads (ex: Google, Bing, Yahoo, etc). Improving your website’s SEO can help improve organic traffic. Email: these people come from emails that have links to your website. This can indicate how your emails are performing. Referral: these people have come to your website from another site or referral source that has linked to your website (ex: a news source does an article about your business and links to your website in its online publication). Social: these people come from social media networks, such as Facebook, Twitter, and LinkedIn. Being active on Facebook helps build a rapport with the community, plus it can bring traffic back to your website – make sure you have your website in the “About” section of your social profiles and link back to your website when relevant. Paid: these people have clicked on a search ad (CPC, PPC, or any form of paid search advertising) that brought them to your website. This can be an indicator of how well your ads are performing. Display: these people have clicked on a banner or display ad (some type of graphic paid ad) that brought them to your website. This can be an indicator of how your ads are performing. (Other): this category isn’t as common unless you’re setting your own tracking parameters. Traffic is placed in this channel if it doesn’t match any of the other channels above. Think of these as a hierarchy. The account is simply what you sign into to manage all your properties. Therefore, if you make a change to any account settings, it’ll apply to all properties and views. Properties are websites. You can have multiple websites that you manage under one account. If you make a change to a property, it will only apply to that one property and its views. 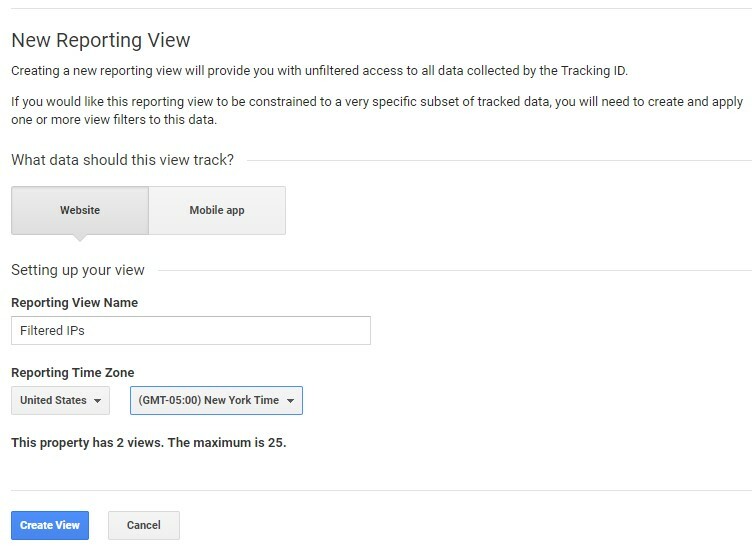 A view is a set of specifications for tracking data – at set up, your account will have a completely unfiltered, “all traffic” view, but you can opt to create a new limited view based on the data you need. For example, you could filter out your internal traffic or create a view of all traffic coming from a specific geographic location. (*Note: Always keep an unfiltered view – if you opt to filter your traffic, create a new view). Believe it or not, there’s still a lot more you can do with Google Analytics data and tracking. Don’t be overwhelmed! There’s a learning curve to using Google Analytics, and the more you familiarize yourself with the platform, the easier it’ll get. Check out our next blog, which goes over delving deeper into the data and tracking more elements on your website (such as site search). First, let’s go over why using Google Analytics to monitor your website is important. Google Analytics is a powerful tool that does all the hard work for you. It collects a lot of data about the users on your website to help you determine how to best market to your customers. It can also help you figure out where you can improve your business. Learn about some of the most helpful metrics you can track in our Google Analytics 101: Navigate and Track blog. Plus, it’s completely free to use – yes, completely. Setting up your Google Analytics account is really simple – you don’t even need a Gmail account to use it! However, if you do have a Gmail account, we’d recommend using it so everything is linked together under the same email address. Any Google platform can be “linked” together (Analytics, AdWords, Google My Business, YouTube, etc), which simply means you’re using the same email and password for each platform. And if you’re already signed into one, you’ll automatically be signed into the others by default. Having them linked under the same email address makes it a lot easier to fully manage your business and the associated accounts. Step 1: Go to analytics.google.com to set up your account. Fill in the fields for your new account. Step 2: Click “Get Tracking ID” – the “UA-“ code is your tracking ID, but you’ll need to use the full code in the “Global Site Tag” box on your website (see Image 1 below). If you have someone who manages your website for you, send them this entire code (we recommend pasting it into a “Notes” file and sending it over). If you’re doing it yourself, it will depend on the website platform you’re using. Ultimately, it needs to go into the <HEAD> code of your website. Many website platforms (such as Wix or WordPress via a plugin – see example in Image 2a and 2b below) have a designated area to put the code or ID that will automatically apply it across your whole website. Step 3: Once the code has been added to the website, you can “Send test traffic” (see Image 1 above) to test if the code is working properly OR you can wait a day or two to see if data comes through correctly. To check the data after a couple of days, go to the Audience section of your account. Select “Overview” underneath it and see if there is any data showing up. (*Note: You can alter the date for the data in the upper right corner; hover over the section titles to get a box that defines that data). To learn more about Google Analytics and the important metrics you can track, check our next blog, Google Analytics 101: Navigate and Track. We’ll show you how to navigate the tool and find the metrics you need to better your business. The biggest weekend in retail starts on Black Friday, but one of the most important days for our customers is Small Business Saturday. Small Business Saturday was created in 2010 to encourage consumers to shop small and local. Oftentimes, consumers are going to big-box retailers and e-commerce stores on Black Friday and Cyber Monday to get significant deals on products they’re looking for. Your biggest asset as a small business is that you’re part of the local community. You can build relationships and become a trusted source for your customers. In addition, you have the ability to provide personalized, hands-on customer service. What resources are there to promote your business on Small Business Saturday? American Express originally created Small Business Saturday, and they have a lot of free marketing materials and tools you can utilize (even if you don’t accept AMEX at your business). Check out their Shop Small Studio for more. For many households, smart thermostats are the starting point that lead to the purchase of more smart home technology. According to the research firm, only 16% of these thermostats are purchased through HVAC dealers, which means there’s a lot of opportunity for home technology retailers to provide these products to consumers. “For smart thermostats, a household that buys this device frequently moves on to a smart speaker with a personal assistant as their second or third smart home purchase,” said Brad Russell. Nearly half of smart thermostats bought in 2017 were upgrades to older models as well, so not only does a smart thermostat sale mean a potential future smart home product purchase, but that they’re also likely to upgrade their current technology too. Smart thermostats are operating as the gateway to more smart home device purchases, and the industry is reaching the point of crossing over from early adopter consumers to early majority consumers. With 26% of U.S. broadband households owning at least one smart home device, there is a lot of room for home technology retailers to jump in and grow with the smart home technology market growth. By filling your customers’ needs with convenient and efficient smart home technology, you can become a trusted smart home device expert your customers choose to rely on. Smart home products provide a growing product segment and customers that are likely to become repeat business. Our Facebook Page Like us! Our Twitter Feed Follow us!